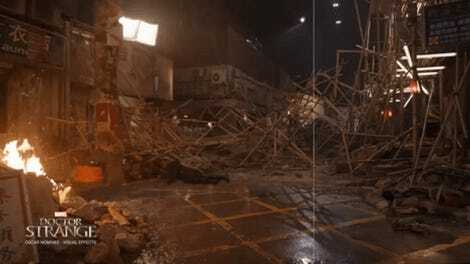 A blockbuster like Marvel’s Doctor Strange relies on countless visual effects studios to help bring the film’s imaginative world to life. 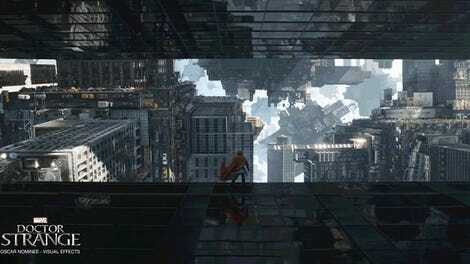 We’ve already seen how Industrial Light & Magic warped New York into a giant knot, but now we’re getting a peek at how Framestore created Doctor Strange’s spells, portals, and that wonderful cape. Those magical portals that Doctor Strange was able to summon seem decidedly less magical when they’re revealed to be originally nothing more than a green box inside a storage closet. It’s also surprising to see just how many times the film relied on a digital stunt double for Cumberbatch. They created an elaborate visual model of the actor that could do literally anything, and yet all the special effects know-how in the world couldn’t give him a convincing American accent. Technology still has a long way to go, it seems.